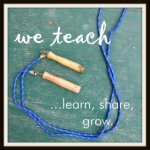 Last week, we moved on from Moses and learned about Joshua. 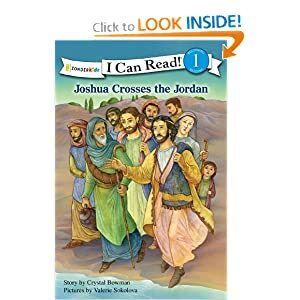 Jonathan wasn't familiar with the story of Joshua before this week, but he really liked learning about this biblical hero. We read the stories about Joshua from Jonathan's toddler Bible, the Bible in Pictures for Little Eyes. The stories of Joshua were covered in about five different stories, so we did one a day at the breakfast table. This is another book from the Beginner's Bible I Can Read! series. It's a higher reading level than most of the books we've been reading. 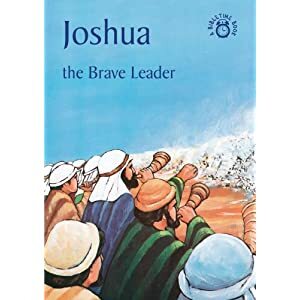 It focuses primarily on the selection of Joshua as Israel's new leader, and Joshua leading the people across the Jordan River. Jonathan loved this book and carried it with him around the house. This particular series (Bible time) is a new one for us. It's meant for reading aloud to age 3+. the stories are a little longer than the easy readers, so I divided the book into two days. This particular book focuses mostly on the story of Joshua and the walls of Jericho. I like that it's very faithful to the biblical narrative, and it also ties in some application points without being too preachy. For example, after telling about the selection of Joshua as the new leader of Israel and the promises God gave to Joshua, the book says "God is the same today and he promises to be with those who trust him". It looks to be a great series for preschool aged children. Jonathan liked this book as well, but not as much as the first book. He still would pull the book off the shelf and flip through it. He liked the pictures especially. We built the walls of Jericho with our cardboard blocks. We marched around the blocks and then knocked them all down! I don't have pictures- sorry! We were too busy marching. Both Jonathan and Grace enjoyed building with the blocks this week. We learned the song "Joshua Fought the Battle of Jericho" and sung this with daddy several times this week. We watched the Veggie Tales classic "Josh and the Big Wall", which is available for steaming on Netflix. Jonathan really enjoyed this movie and laughed at the silliness of it. Charlotte Mason emphasized the importance of instilling good habits during early childhood. We recently bought the book A Child's Book of Character Building (both volumes). We're focusing on attentiveness which is defined as "listening with your ears, eyes, and heart". The verse is Proverbs 4:20-21. We've done a few exercises pertaining to this, which I may share in a future post. Next up... Gideon! Have a great week! This post is linked up to these linky parties. I like the sand paper walls. Good idea. I agree with Ticia...and I TOTALLY understand not getting a picture of marching around the wall- I would have too much fun doing that activity MYSELF to have time to get a picture! Great craft!! Simple and effective. Love it!